"In the dark corners we dwell, still-born Kindred for whom your clans have no meaning. Our blood is your blood, yet different. It has been willed, strained and afflicted until it has taken a different course in our veins. We are your worst nightmare, childer who defy your designs to forge our own veiled destinies. Placate us, serve us and we might give you a taste of our secrets." 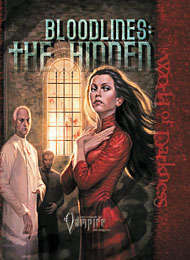 Bloodlines: The Hidden is the first in a new Vampire series that focuses on the refinements and abuses of undead blood. Drawn from the shadows are 12 bloodlines from all five clans, lineages that diverge from the clans and that have dedicated the ages to keeping their existence secret, or to lurking on the edges of discovery, devising their own inscrutable machinations. And now you can play them. This title was added to our catalog on February 28, 2005.